You know it’s a holiday home when you are welcomed in through a bright blue door enveloped by white walls, a la Santorini. 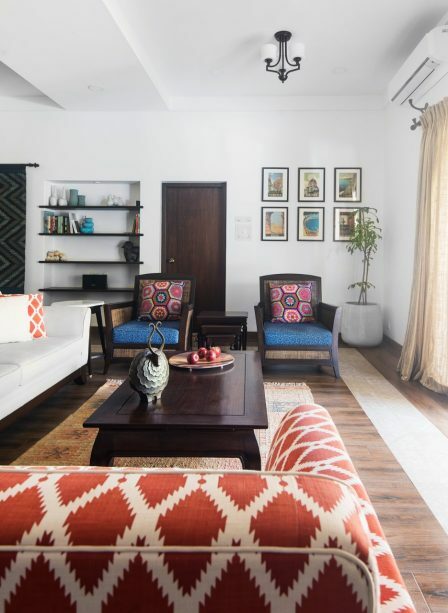 Put together by the design team at Abaca, the home channels a laid-back vibe with a large living room that opens out to a languid pool and lush lawns. We love how regular walls have been swapped with stone ones and painted in white to give it a resort-like feel. But that’s where the cliché ends. The door opens into an expansive living and dining room dressed in vibrant orange and moody blues. Even though it’s a holiday home, a lot of elements have been personalised to create a homely, lived in look. Borrowing from the idea of traditional patchwork, the dining chairs have been upholstered with different swatches of fabric so that no two chairs look alike. We especially love the flooring. Similar in look to wooden flooring, the wood-like vitrified tiles are not only easy to maintain but also easier on the pocket. You can break the monotony like they have with a border of printed tiles. If you reverse it, then the central part with printed tiles can also give the illusion of a carpet. It’s a thoughtfully planned home, even though it’s a second home. Personalisation is something that one can use even while doing up a guest room so that it feels as welcoming as the rest of the house. Every area has quaint details – an antique key holder in the entryway, needlepoint cross-stitch pieces done by the matriarch in every room and a vegetable patch to boot.